The day after I submitted my letter stating my retirement date, I made a list. Actually, it was two lists in one. The first column listed small renovations and repairs that we might consider doing before putting the house on the market. We have already done a number of things that add value to the house in the five years that we have been here, such as replace the roof, adding a range hood and fan in the kitchen, and so on. (Shout out to Rob!) The house had been newly renovated when we bought it, and the inspection showed that it was a solid house with no issues. So this list is mostly focused on "spit and polish" items that will help it show well. The other column listed things that we could do to declutter and tidy things up. There are just two of us rattling around in a great big house, but we have a lot of stuff. This is in spite of giving away heaps of stuff (furniture, wood stove, tools, canoe), and throwing away lots of other stuff (old ski equipment, broken toys) when we moved last time. While neither of us is a hoarder, we are very fond of our stuff. Although we have not set a date to put the house on the market or to start looking to buy, we want to give ourselves lots of time for the transition process. So far, Rob has been the true hero in this endeavour. He already has gone off to the recycling depot with five boxes of old computer parts and cords. He also has climbed into the attic of the storage shed and begun rooting through the old sports equipment (I'd thought we had already gotten rid of that stuff???) and has begun throwing things out (e.g., ancient tents with broken zippers). He also moved a pile of his totes out of the basement storage room, revealing the awful truth that most of the boxes in that room are mine. My stuff that needs sorting comes in four categories: things that belong to my kids that I have been storing for them; boxes from previous moves that I never unpacked; boxes of career related materials (about 25 bankers' boxes in our basement), and books. I decided to start with the books. Specifically, there was a stack of twelve boxes of books in the spare bedroom, still never unpacked since we moved here. I began unpacking them and sorting through the books, all the while muttering that it seemed ridiculous to be unpacking boxes, knowing that soon enough the books would just have to be packed up again when we move. It is very hard for me to get rid of books. I have always viewed my books as precious. In the seven frugal years when I lived the life of a poverty-stricken student, books were one of the few luxuries that I allowed myself to purchase. Although I am happy to give books to my kids, or to friends who love to read, or to students, I abhor the thought of books going to the landfill. So, I have a lot of books. As I unpacked each book, I held it in my hands and thought about who had given me the book, or who had owned it before me, or how that book had shaped my thinking decades ago. And then I asked myself whether I would ever read it again, or if I really needed a book of lists from the 1990's, or a book from the 1980's about pregnancy. I considered whether anyone close to me might want the book. And then, ruthlessly, I sorted many of them into good-bye piles. I have taken two boxes of books to the university to put on the "free books" table for students. I have stuffed the Little Free Library with novels. I have taken four boxes of books to the secondhand bookstore. The bookstore owner took about half of them and said he would give the rest to charities. He tried to pay me for them, but I talked him into letting me take two books from his shelves in exchange. (Uhoh! I'm supposed to be getting rid of books, not acquiring more books!) And, sadly, four boxes of books are going to recycling. The rest of the books, old friends, have found space on my bookshelves. I have finally found my art books, my poetry books, my gardening books, and my outdoor books! I still have way too many books. I now have three shelves of books, mostly fiction, in my den. There are books in the bedroom, the living room, the kitchen, and the basement. 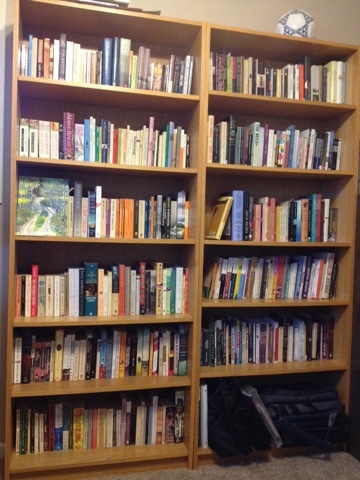 At least fifty of them are books that I have bought or been given but have not yet read. There are about twenty boxes of children's books in the storage room, and I am not throwing out any of those. I have been transporting them, a few each time, to my grandchildren when I go for visits. And then there are three floor-to-ceiling shelves full of books in my office at my workplace. My heroic book decluttering has eliminated just a small fraction of our collection. The other day, I opened and sorted a box from the basement storage room. 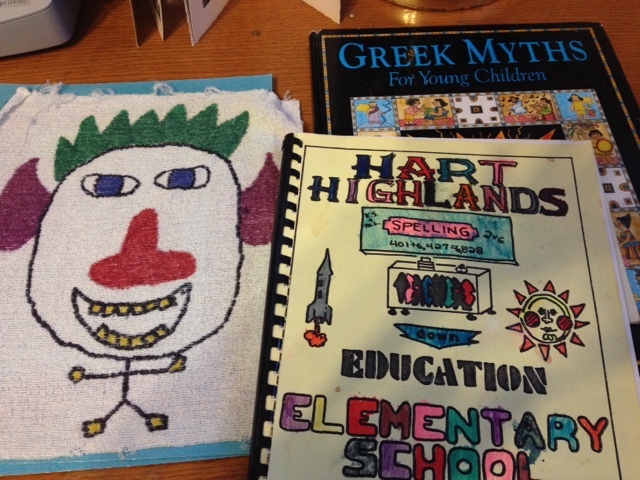 It contained, not surprisingly, books, and also a lot of my children's art. For example, I found calendars from twenty years ago that my kids had made me for Mother's Day, and stories they had written. I found the travel diary we had kept when we took a six week trip down the west coast of Canada and the USA in 2001. It took me two hours to sort through one little box because I had to read the diary and every one of their stories, and look at every picture. It sure is a good thing that I move every once in a awhile because I get to rediscover these treasures and take a sentimental walk down memory lane! I feel your pain, Jude. Books are one of the hardest things for me to get rid of too. Good luck with the rest of your downsizing. I have my fingers crossed that your move will take you out closer this way! I have never been a huge reader, so I don't have that many books. My daughter has hundreds though! She still prefers a book over an e-reader, so we'll have some of the same problems you are facing as we get ready to downsize this summer. She gives books away to our local library for a big sale each year, but we always laugh because she comes home with almost as many as she donates! I guess there are worse problems to have! Yes, Donna, books are hard to part with unless I can find someone who will appreciate them to give them away to. I have had great fun stocking the Little Free Library and the "free books" table at the university. Vicki, I read lots of newspapers and articles online. In fact, that is my favourite way to do that kind of reading. But nothing beats the real physical object when it comes to a novel. Also, I find art books, poetry books, and art magazines much more enjoyable in their physical form. When it comes to cooking, well, I do look up some recipes online. But I also love my collection of cookbooks. They have so many memories attached to them. I also have a folder of hand copied or clipped out recipes that I return to again and again. There's a lot of satisfaction in the process of eliminating unnecessary things in our life. At the same time, paring down our precious books is a challenge! It looks like you are making good progress Jude! It will be interesting to follow along your journey as you prepare to leave the workforce. I remember it all too well. I predict that you will be a very successful retiree! Jude, I had exactly the same dilemma with what sounds like the same number of books! It sounds as if you are handling it beautifully, divesting yourself of what you know for sure you won't ever refer to again after one last squeeze of pleasurable memories from reviewing them. It's fun now, isn't it, to be able to have your outdoor books and other books for this new stage of your life front and center. I'm finding that any other books I still have (and there are still many) are stored in rubbermaid bins. Once a year I go through them again, looking to see if my life has continued to change in a direction that would make them redundant. I still have all of my adult facilitation books because I'm just not sure. I find this kind of review a good marker of progress. FYI. Are you familiar with "Better World Books." They have donation boxes in some cities, but in general their mission is to "save books from landfills." I have probably purchased several boxes of used books from them over the past few years, but have yet to donate any! That time may come. Carole, thanks for your prediction. Sometimes I wonder whether my approach of retiring in phases over a long period of time is actually harder than just just retiring cold turkey! It's kind of like inching into a cold lake rather than just diving in and swimming. Karen, it was great to find your blog and begin reading it. Somehow, it seems to make the journey less difficult when you find others who are going through the retirement process too, and sharing their insights. I like your approach of looking through your books at yearly intervals. My daughter had a great piece of advice about reducing one's material belongings. She said she acknowledges the purpose the book or other item served at some point in her life, and then she lets it go. She said she doesn't need the actual object/book as the effect of it on her life and thinking still remains. B. E., thanks for the tip about Better World Books. What a wonderful concept and organization! Unfortunately, as I live in western Canada, we do not have donation bins anywhere close to here. However, I am donating or giving away all of the books that I no longer need that are in decent condition. The only ones that are going to recycling are very outdated (e.g., Mexico on Five Dollars a Day from 30 years ago) and/or in poor condition. While I love to get rid of things and de-clutter, memorabilia are hard to throw out. Most of my study books went to recycling, unfortunately, and every year I visit my parents' attic with some precious boxes of my stuff, I try to get rid of things. I still have shelves full of my teaching materials and lesson preparations. All that work and time and creativity that was invested in it... I know I should get rid of it all, it's not that I will ever teach again, probably, and at least not in Belgium or in the Dutch language. And, these days all those preparations are done on the laptop anyway. Yeah... I mostly just go up there in order to go back to memory lane. The thing about items from the past is that they are precious because they stimulate memories of things or events that were important to the formation of self or identity. Or they are reminders of loved ones at earlier stages of life. I fear that if I throw those things away, I will never again retrieve those memories. Just like your teaching materials probably remind you of your teaching life and identity, which is still important to you, even though that is not the current focus of your life.